FOX IV knows bag-labeling. We have designed several different bag labeling systems. For filled bags, FOX IV can put a label printer-applicator or label applicator on your production line to label bags after filling, but before palletizing. Information such as date and lot codes, bar codes and contents are printed and/or automatically applied to the bag on the existing conveyor line. This can be accomplished with any FOX IV labeler. The specific model and size of the labeler depends on the label size, print engine preference and throughput rate. For unfilled bag labeling, FOX IV has designed a bag feeding and labeling system. 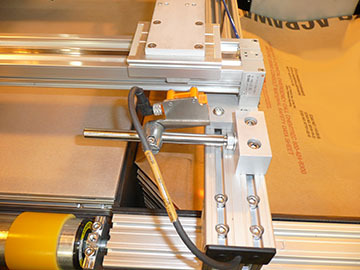 This system takes advantage of a robotic vacuum lifting system to present the empty bag to the labeling unit. 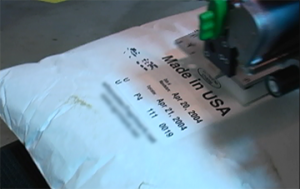 Once the bag is presented, the labeler prints and/or applies the information label to the empty bag. It is then shuttled to a collection bin to await the filling process. Either bag labeling system can be integrated with current database/order processing systems or set up as a stand-along operation.